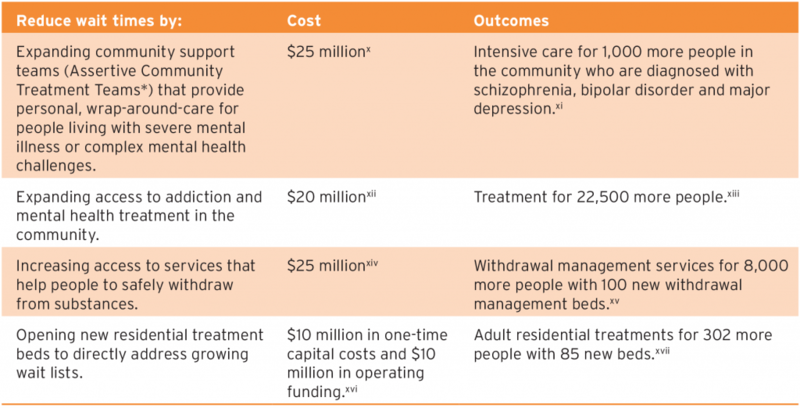 The government has committed $3.8 billion to mental health and addiction services over the next 10 years. We know that year after year, we are facing more overdoses, more emergency department visits related to mental health and addiction challenges, and a growing reliance on emergency services amid growing waitlists for these services in Ontario. Ending hallway healthcare by ensuring emergency rooms and hospitals aren’t the first or only point of contact for those with mental health and substance abuse challenges. Reducing wait times to treatment by providing faster access to mental health and addiction care. We need a mental health and addictions system that supports Ontarians before they reach crisis levels and keeps people out of hospital. By increasing services in the community and by helping people to stay in their homes, we can provide support before hospital-based care is required. We can also work together with Ontario hospitals by providing local support within hospitals through innovative programs like Rapid Access to Addiction Medicine (RAAM) clinics that connect patients directly to community-based addiction treatment programs from the emergency room. And by expanding intensive services within the community for patients with high needs, doctors and nurses in hospitals can safely discharge patients from hospitals with confidence, knowing that they will receive the level of care they need back home or in community housing. We need a mental health system that is there for Ontarians when they need it most. By increasing capacity in community-based care, including increasing access to residential treatment and withdrawal management services, we can reduce wait times to treatment and improve access to intensive services that are desperately needed in this province. We need a mental health system that will provide our youth with every support they need to have a healthy future. By expanding community addiction services and increasing access to treatment beds, we can ensure that Ontario provides early intervention services so that young people get the support and services they deserve. One in seven high school students report symptoms of drug use problems but less than 1 per cent are accessing a treatment program. Over the last 10 years, emergency department visits and hospitalizations for children and youth with mental illness and addiction have increased by more than 60 per cent. 12,000 children and youth remain on a waiting list for mental health services. By working to address the critical gaps in our system we can finally create the addiction and mental health system our province deserves. And by investing in local, community-based care to end hallway health-care, reduce wait times and increase support for our children and youth, we can make mental health a priority in Ontario.